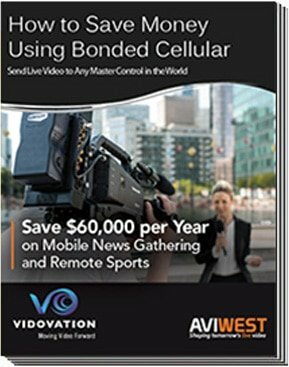 The PRO380 is our flagship mobile video encoder & transmitter solution designed for live video producers and news gathering professionals looking for contribution performance from any location around the world. With its large set of professional audio and video interfaces, the PRO380-RA supports the best state-of-the-art H.265/HEVC hardware encoder by offering premium video quality with less data usage, and low end-to-end latency (down to 0.5 sec). The widely adopted H.264/AVC video format is supported as well for compliance with deployed infrastructures. It features 8 embedded world-wide compliant cellular 3G/4G-LTE modems with a high efficiency patented custom antenna array. All are available in the unit, but the device can also be remotely connected to AVIWEST’s QUAD Antenna external antennas for strengthening the signal transmission in a critical environment. Additional links such as built-in Wi-Fi and Dual Gigabit Ethernet for streaming over LAN/WAN, BGAN, GX or Ka-band Satellite are also natively supported. With its high versatility, the PRO380 is the ideal companion for on-the-go video professionals that need a robust and reliable solution, with the ultimate performance and picture quality. Featuring real-time network detection, eight 3G/4G internal modems with an internal high-efficiency custom antenna array, a built-in Wi-Fi modem, and two best-in-class H.265 video encoders, the PRO380 can be used to stream live HD video down to the receiver with minimal delay. Designed with you in mind, the unit is just over 2 lbs and can be easily mounted on any broadcast camera (e.g., SD/HD SDI, analog [BNC] and HDMI) and mounted via V-Mount, Gold Mount, or PAG plates or used in an optional back-pack. The PRO380 allows easy configuration, operation, and intercom. PRO380 with support for 2 External QUAD Antennas for Indoor or Vehicle use. Robust signal transmission enables live broadcasts anywhere in the world: In addition to the internal custom antennas, the PRO380-RA version has eight MCX antenna connectors on its front panel. These can be used to support two AVIWEST QUAD wideband external cellular antenna arrays to strengthen signal transmission in critical environments such as live from vehicles on the move. Featuring 8 cellular connections (eight 3G/4G internal modems with an internal high-efficiency custom antenna array), a built-in Wi-Fi modem, and two best-in-class H.265 video encoders, the PRO380-RA can be used to stream live HD video down to the receiver with minimal delay, which allows broadcasters to produce seamless live interviews. Robust signal transmission enables live broadcasts anywhere in the world: In addition to the internal custom antennas, the PRO380-RA has eight MCX antenna connectors on its front panel. These can be used to support two AVIWEST QUAD wideband external cellular antenna arrays to strengthen signal transmission in critical environments such as live from vehicles on the move. A compact, lightweight, and portable design are perfect for in-the-field use: Weighing about 1Kg, the portable PRO380-RA can be easily connected to any professional camera (e.g., SD/HD SDI, analog [BNC] and HDMI) and mounted via V-Mount, Gold Mount, or PAG plates. By providing broadcasters with a video uplink system that is easy to transport, the PRO speeds up newsgathering operations. Simple use and control enable rapid newsgathering: The PRO is designed to automatically detect real-time network capabilities. Through a user-friendly and intuitive touch-screen interface, the PRO allows any on-the-go media professional to easily configure and operate the system as well as communicate with the studio through the IFB return channel. The units can also be controlled by the receiver (StreamHub), the Management System (Manager), the Remote smartphone application or any device connected to the unit through the network.